We’ve waited ages to get out hands on Nvidia’s first DX11 graphics cards – even the product announcement made back in September 2009 was late as ATI had already launched its first DX11 card, the Radeon HD 5870. Six months later and we finally have working cards to test. But, as you’ll note above, there aren’t any cards to buy yet – the prices are estimates and recommended prices because there won’t be stock of these cards until 12 April in the UK. This is rather baffling, as if Nvidia is already very late with this card (and its larger, more powerful sibling, the GeForce GTX 480), it may as well have waited a couple of weeks and avoid the obvious cries of being a paper launch. That would have given us a little more time to play with some of the new aspects of the card, and for software developers to develop and release code publicly for us to test with. These investigations will have to wait, and we’ll therefore concentrate on the gaming performance, temperatures and power consumption of the lesser GeForce GTX 470 in this article. The GeForce GTX 470 is a more mundane card than it's bigger brother, the GTX 480. Click to enlarge. The GTX 470 is a more mundane card than the GTX 480, with no shroud-breaking heatsink or overhanging heatpipes. The card is 9in long, with two 6-pin PCI-E power inputs that poke out the side of the plain-looking cooler cover. 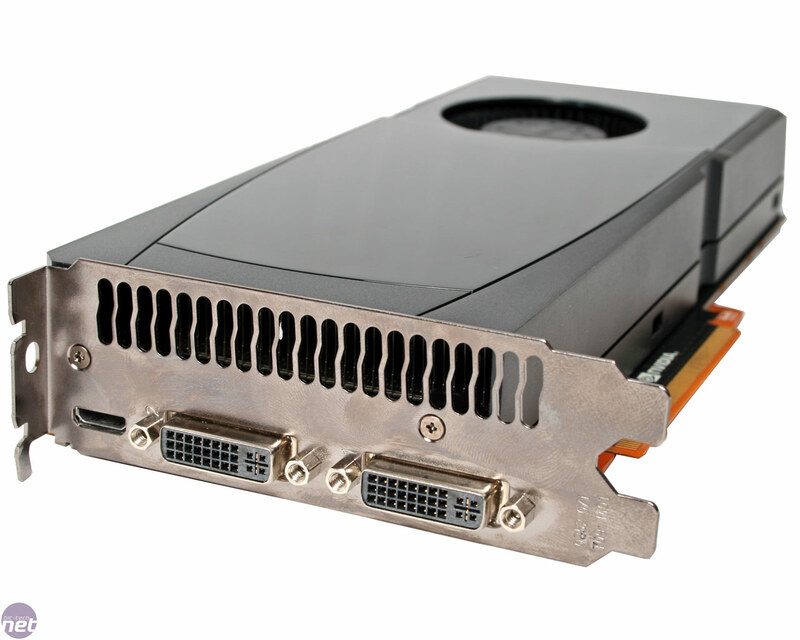 At the back of the card is the same pair of dual-link DVI ports and the mini-HDMI output, leaving the full length of the second expansion slot for the hot air vent. In all, this card really doesn’t look particularly remarkable. The GPU underneath is, obviously, much more interesting. 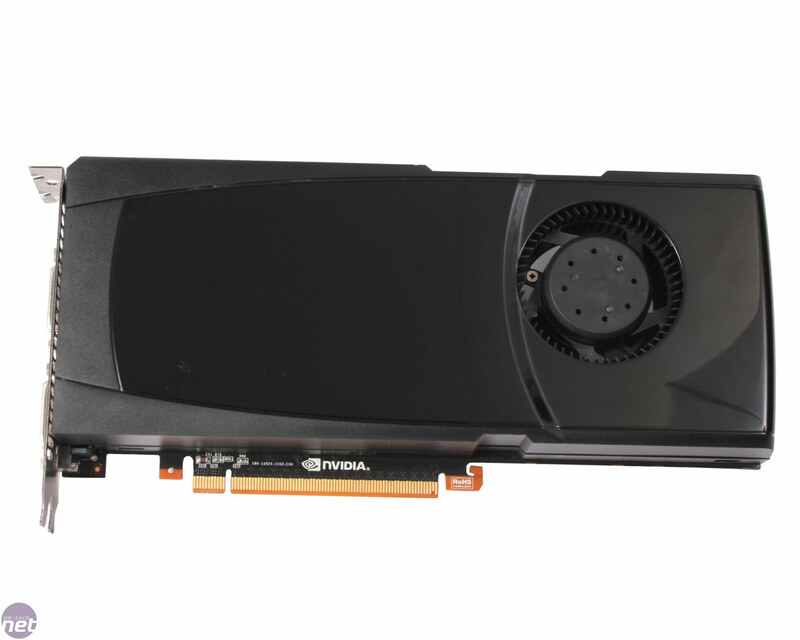 Several parts of the GTX 480 GPU have been chopped out and the clock speed has been reduced by a significant amount when compared to those of the GTX 480. For example, while the GTX 480 has 480 stream processors (we can’t bring ourselves to call them ‘CUDA Cores’ as Nvidia does), the GTX 470 has only 448. Not as comprehensive as outputs on an ATI card, and the mini-HDMI connection is a little odd. Click to enlarge. The memory bus has been trimmed from 348-bit to 320-bit, and that means that one less memory chip can be attached – the GTX 470 has ‘only’ 1.3GB of GDDR5 compared with the 1.5GB GDDR5 of the GTX 480. The memory also runs slower, at 837MHz (3.3GHz, effective) rather than 924MHz (3.7GHz, effective) giving the GTX 470 134GB/sec of memory bandwidth rather than 177GB/sec. The core (everything in the GPU that’s not in the GPC areas) of the GTX 470 runs at 607MHz rather than 700MHz, while the stream processors run at 1,215MHz rather than 1,401MHz. The GTX 470 has 53 rather than the 60 texture units of the GTX 480. The cut-down GPU results in a relatively cut-down price, however. While the GTX 480 costs around £420, this card is due to cost around £300. However, that price puts it in competition with the Radeon HD 5870, which can be found for £317.24 (inc VAT). Even on paper, the GTX 470 looks to have its work cut out for it against this card, which has more memory bandwidth, more texture units, and which is capable of 1.36M shader operations per clock rather than 0.54M. Granted, no one of those figures is conclusive (especially the last, with the vagaries of what work an Nvidia or ATI stream processor is capable of performing) but that’s what testing is for.